You are here: Home / Uncategorized / Is Sun Tea Safe? Using the natural rays of the sun to make “sun tea” is popular in the summer. Tea is brewed by leaving a clear container with tea in it out is the sun for a few hours. However, using such a method to make tea is highly discouraged. Sun tea is the perfect medium for bacteria to grow. The essential problem is that sun tea will not get hotter than 130 degrees Fahrenheit, which is not hot enough to kill bacteria in the water or in the tea leaves. 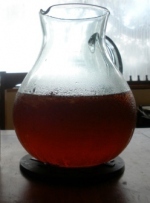 If sun tea gets a thick or syrupy appearance, it may be due to the presence of a ropy bacteria called Alcaligenes viscolactis. Ropy bacteria are commonly found in soil and water. Standard brewing processes for hot tea are always hot enough to ensure that any undesirable microbes are killed, eliminating this risk. In addition to the insufficient heat, sun tea generally sits around at room temperature for a long period of time, giving the bacteria a chance to multiply and become problematic. We know that every summer people brew and drink gallons of sun tea and do not get sick. That does not mean that there are no risks. If you are okay with the possibility of stringy rope-like bacteria breeding in the tea you drink, there is no reason to change your ways. But there isn’t much reason to continue using this method after finding out about its inherent dangers, even if the statistical risk of illness is not great. Plus there are excellent alternatives for making iced tea. Brew tea bags at 195 degrees F for three to five minutes. Some tea drinkers complain that when tea is brewed with hot water, the tea becomes cloudy. The cause of the cloudiness is due to tannins from the steeped tea being released into the solution when the tea is cooled too rapidly. One way to avoid this is to steep the tea then add cool water to bring the temperature down gradually before refrigerating or adding ice. Brew only enough tea that can be consumed within a few hours. Wash, rinse and sanitize tea-making equipment regularly. Cold brew tea in the refrigerator by putting tea in cold water for a few hours (from six hours to overnight depending on how strong you like your tea). Sun tea is easy to make and looks pretty in the clear container, but don’t risk giving stringy, ropy bacteria the opportunity to brew along with your tea! Right on, Justin. According to the above CDC information, hot water steeped tea can be cloudy due to increased tannins. That must be why sun tea tastes better since tannins are bitter. Another thing- unchlorinated water can be made safe to drink by using a PET bottle (has a triangle with 1 inside it on the bottom of the plastic bottle) by filling it 3/4 full, shaking it and leaving in the sun for 6 hours. This info from FEMA. So why not put some tea bags in that water? The Handbook of Microbiology by Jacobs and Gerstein says A. viscolactis’ optimal growth temp is 10-20 C, with a variable temp of 37 C. If sun tea brews around 130 F that is well above the these growth temps. Also UV light has been shown to damage subsurface gram negative bacteria like A. viscolactis. I agree it should not be left at room temp which would be ideal for its growth. Wouldn’t being scared of drinking plain tap water, rather than sun tea, make more sense given this bacteria’s characteristics?